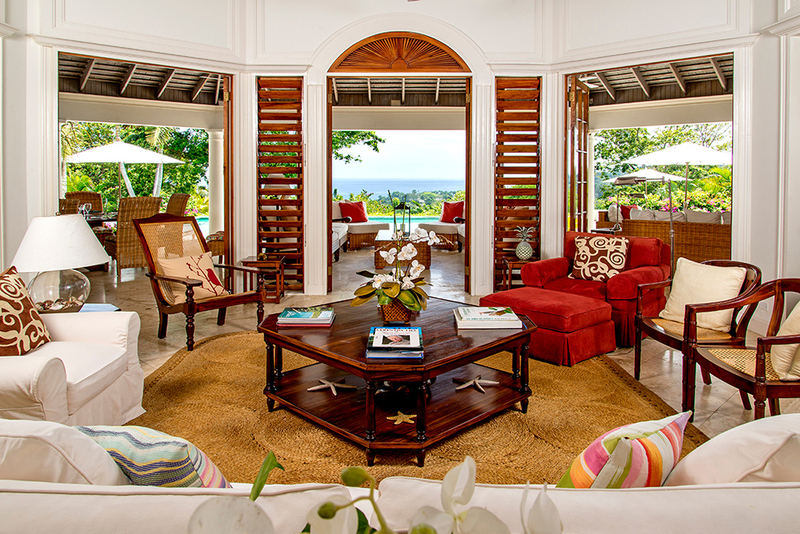 Bougainvillea is one of the most stylish homes in this collection. 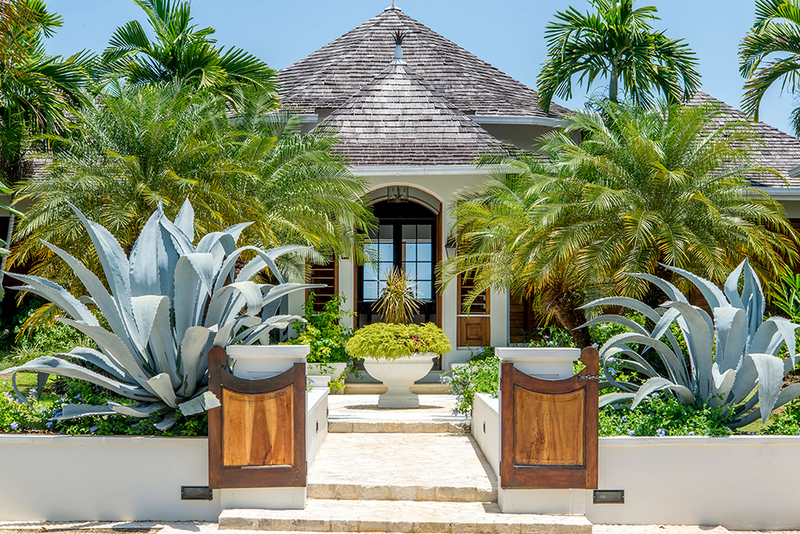 Brilliant architecture and design have resulted in a luxurious state-of-the-art vacation home that is elegant but not daunting. 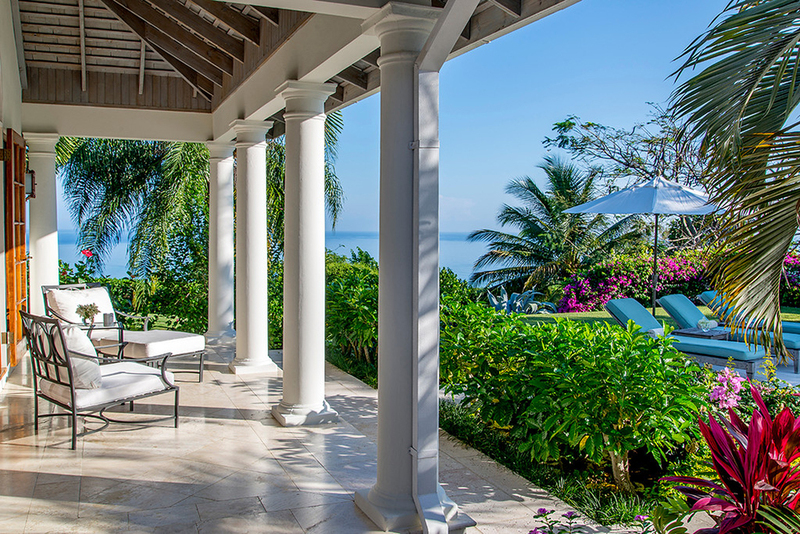 In classic Caribbean Georgian style, Bougainvillea offers 8,000 square feet of indoor and outdoor living space on a dramatic mountainside loft overlooking the deep blue sea. 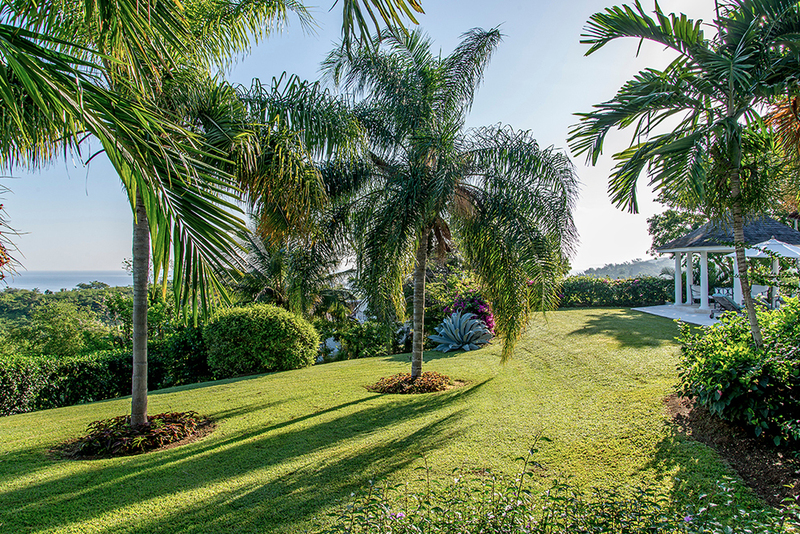 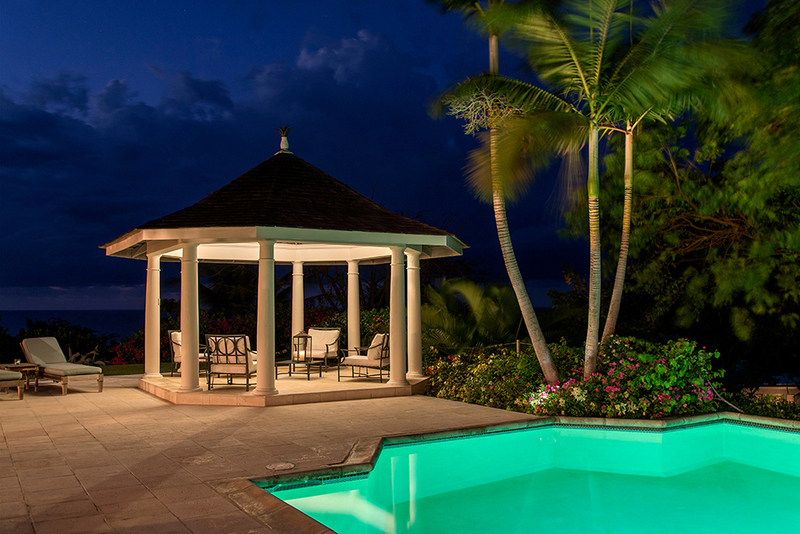 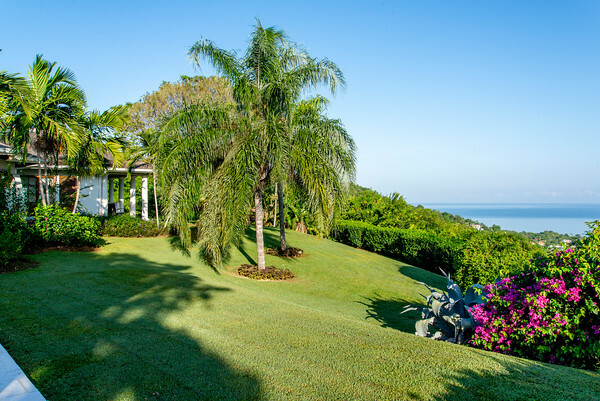 180-degree sea views are dazzling both day and night from this remarkable three-acre site. 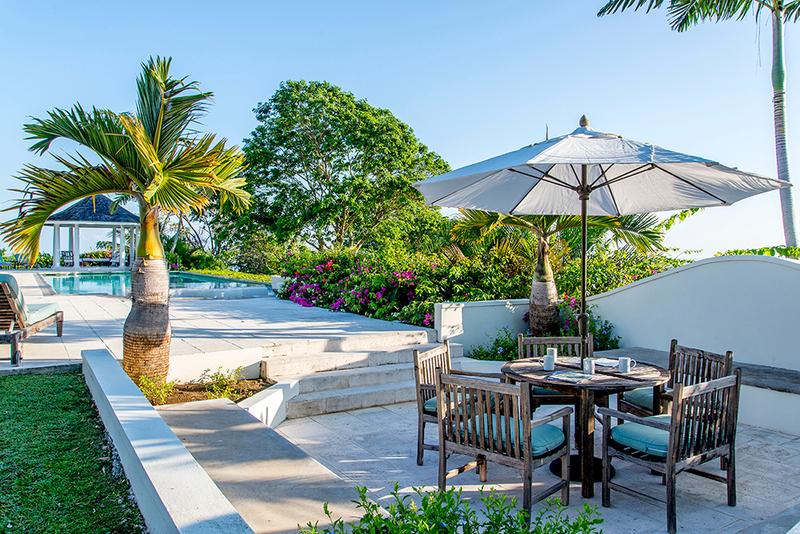 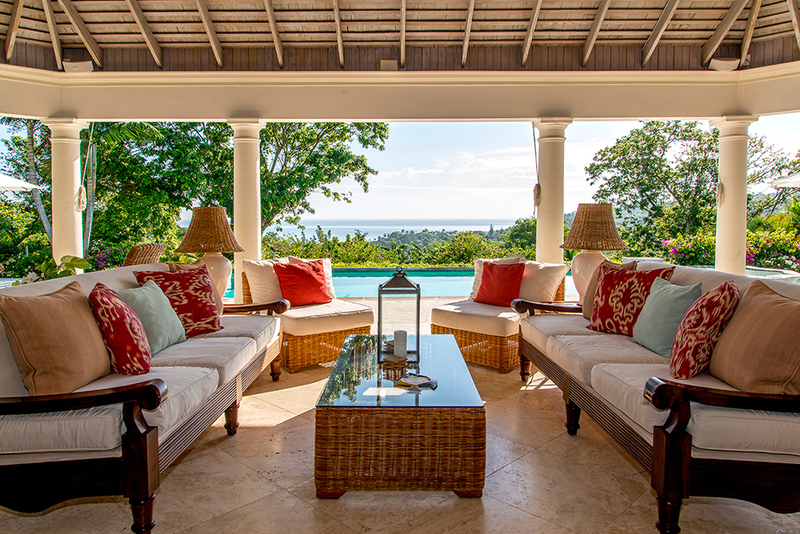 The long furnished verandah is a magnet for guests who want to relax, read, nap, converse over drinks or simply be mesmerized by the heavenly view. 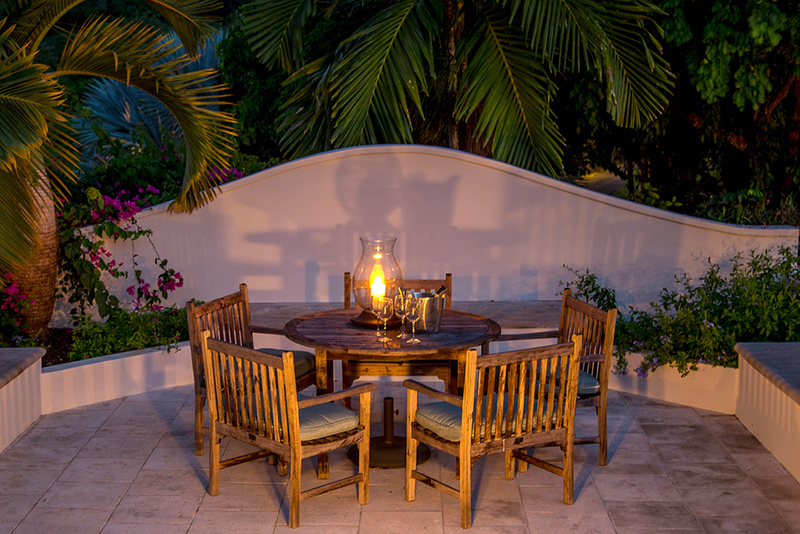 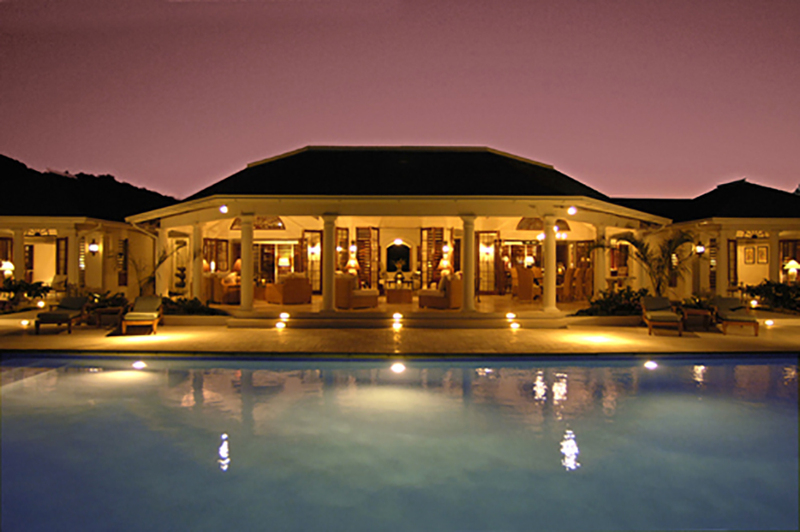 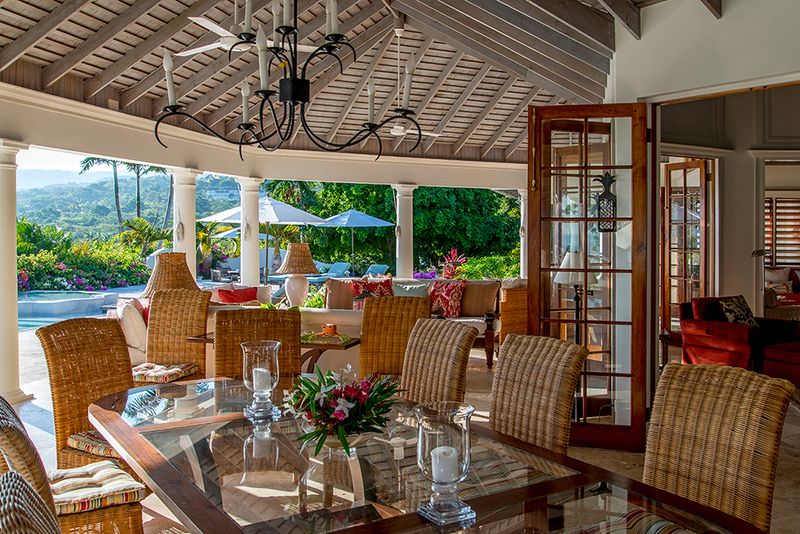 Delicious home-cooked meals from Bougainvillea’s modern kitchen are served on the al fresco verandah or on the gleaming custom-made mahogany table inside that seats twelve. 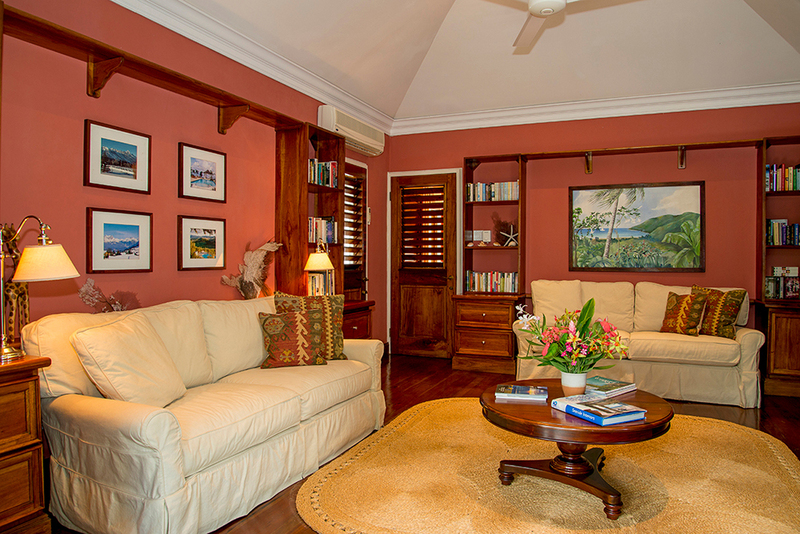 Completing the central core of the villa are the attractive Living Room and the comfortable Family Room with flat screen TV and home theater. 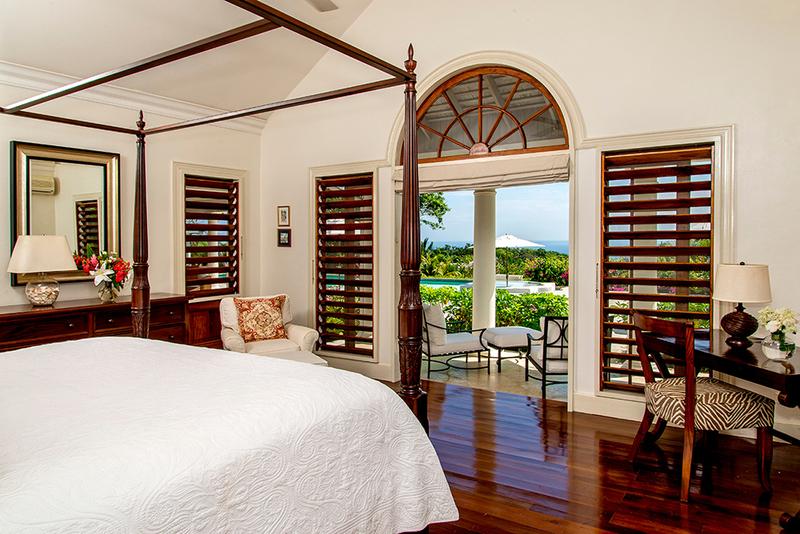 Four very private Master Suites are equal in size and luxury. 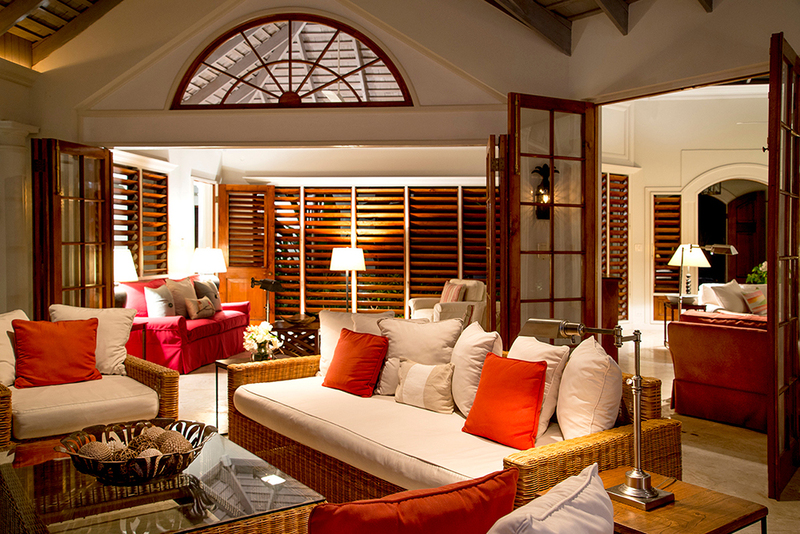 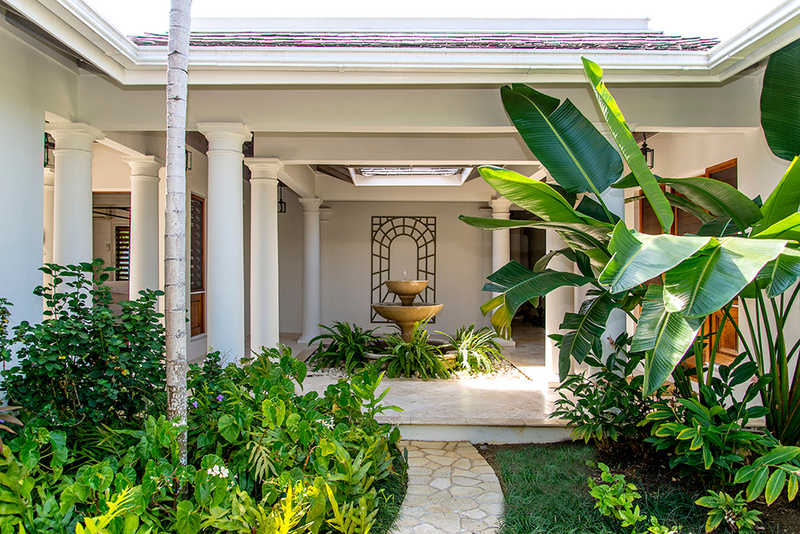 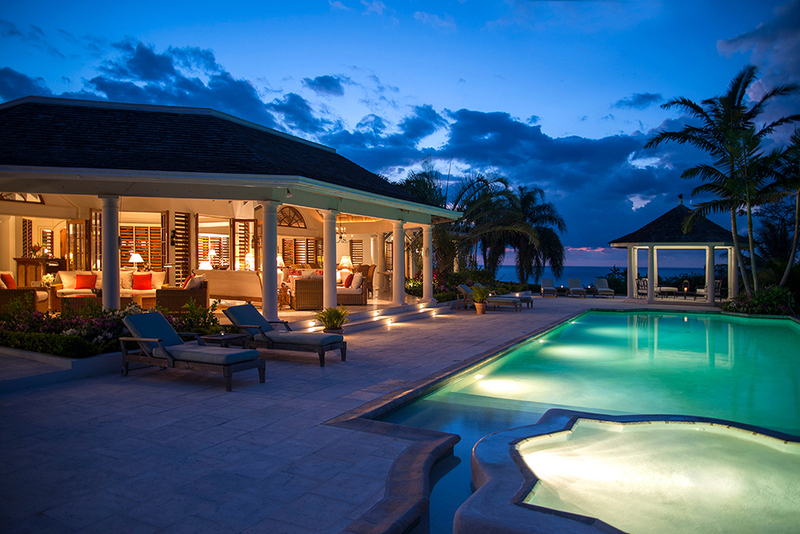 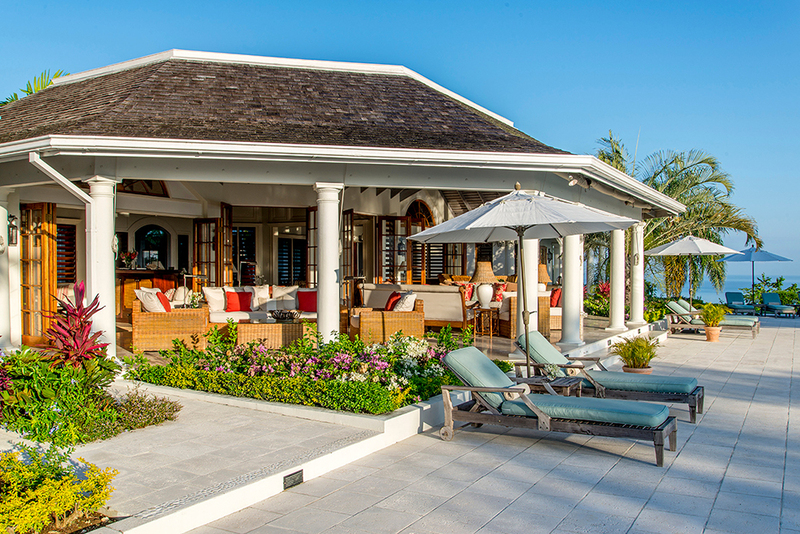 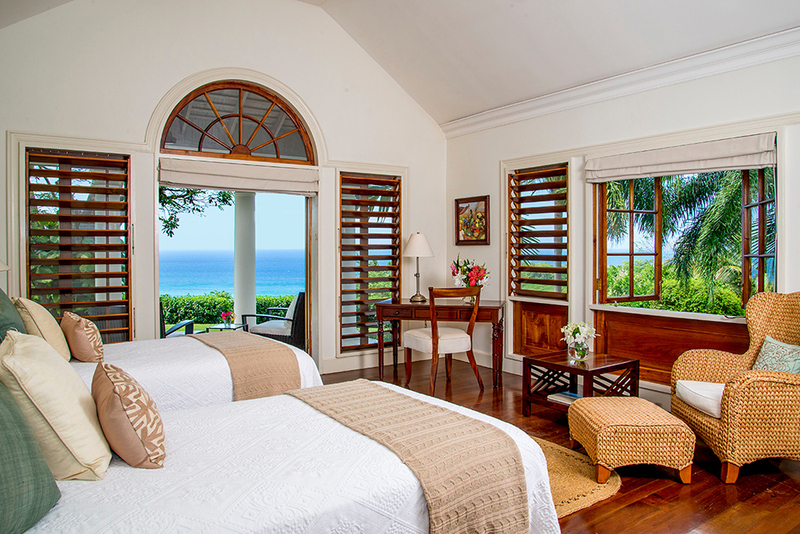 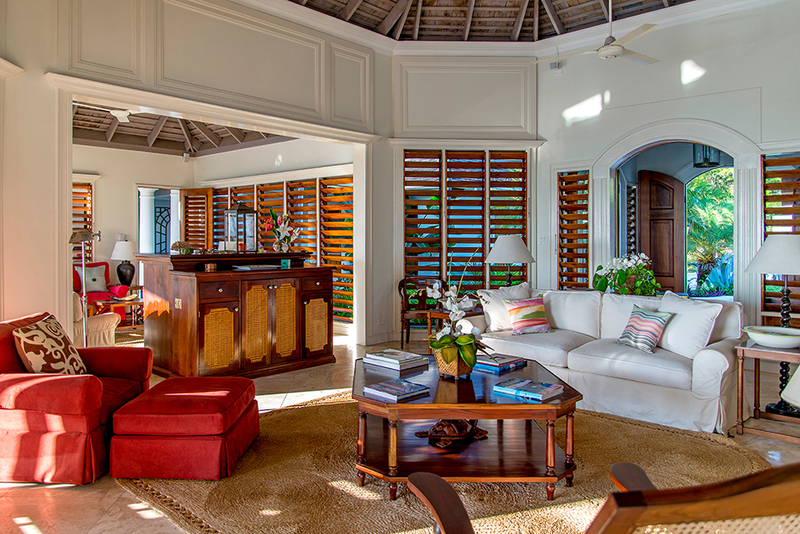 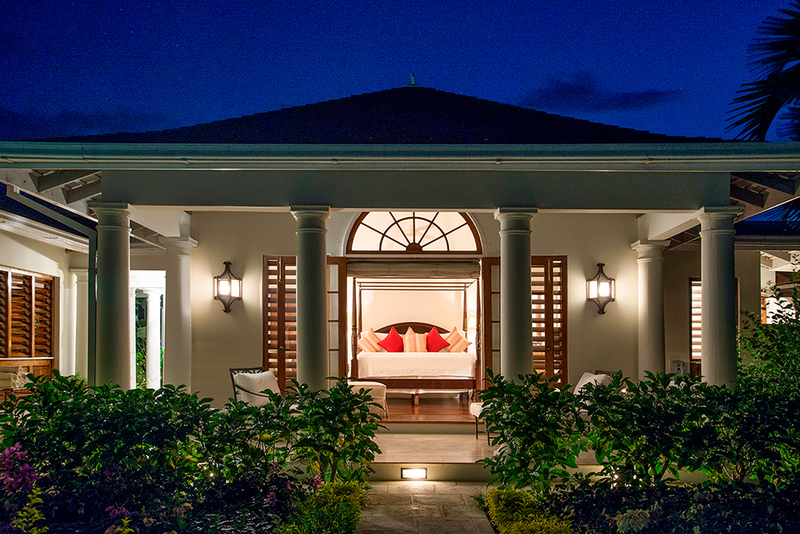 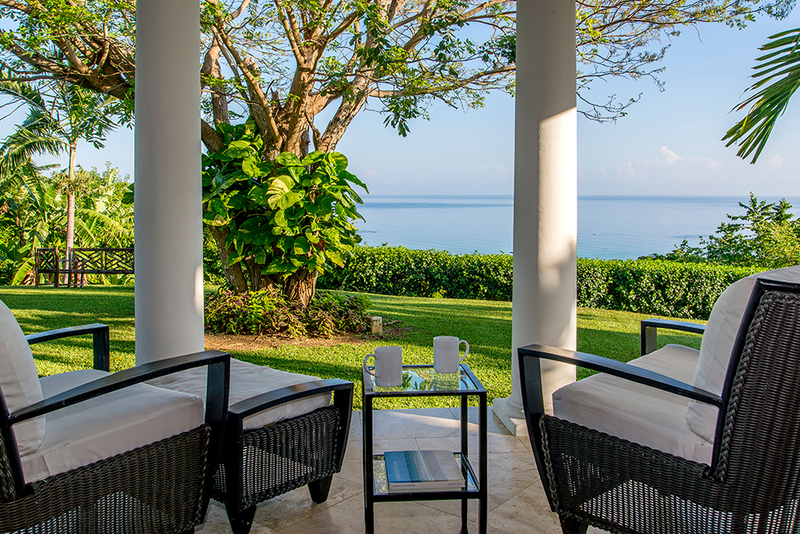 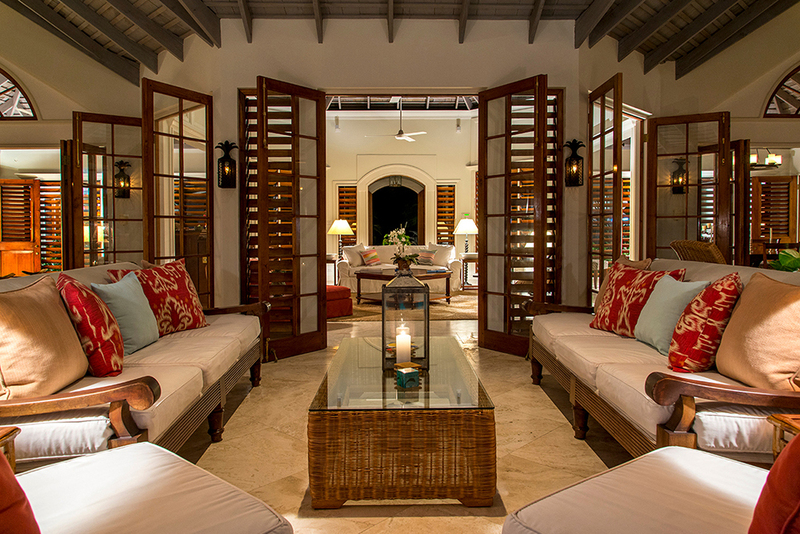 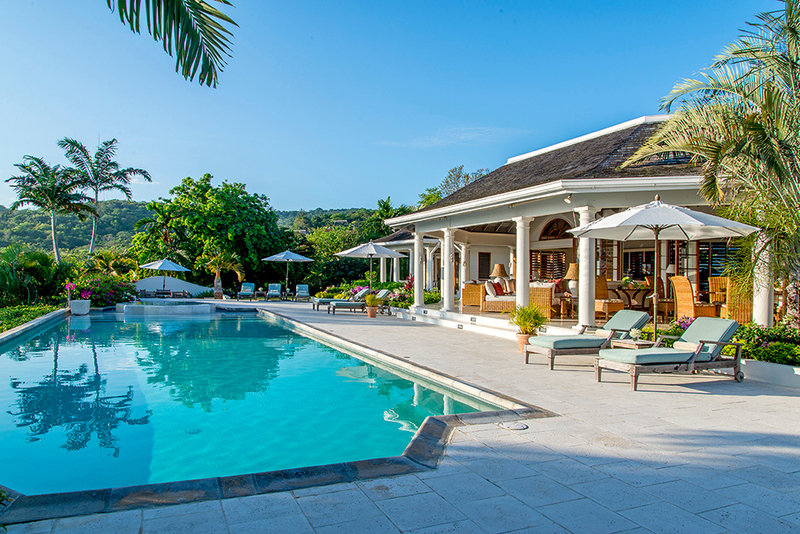 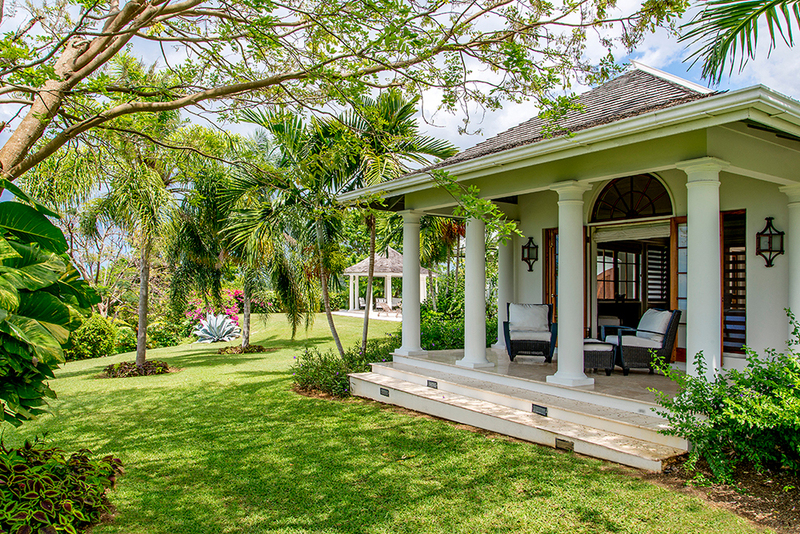 Each opens to its own furnished porch and view of the Caribbean. 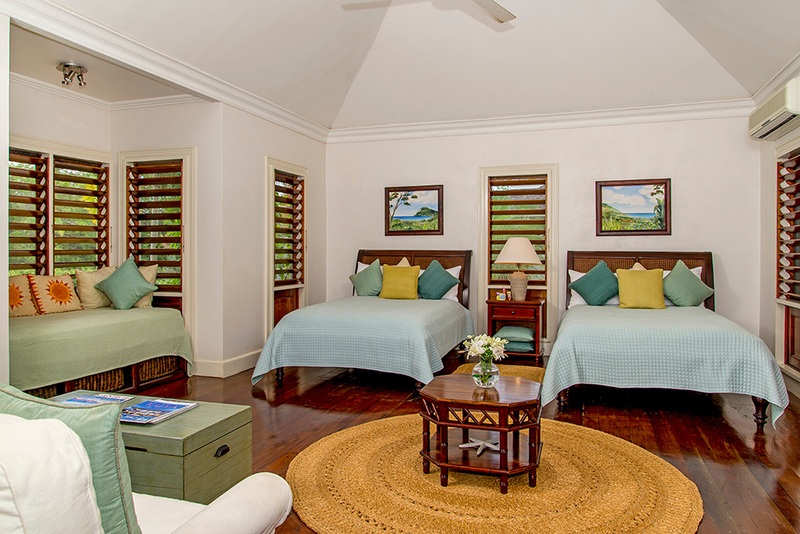 Guests may choose between twin and kingsize bedding. 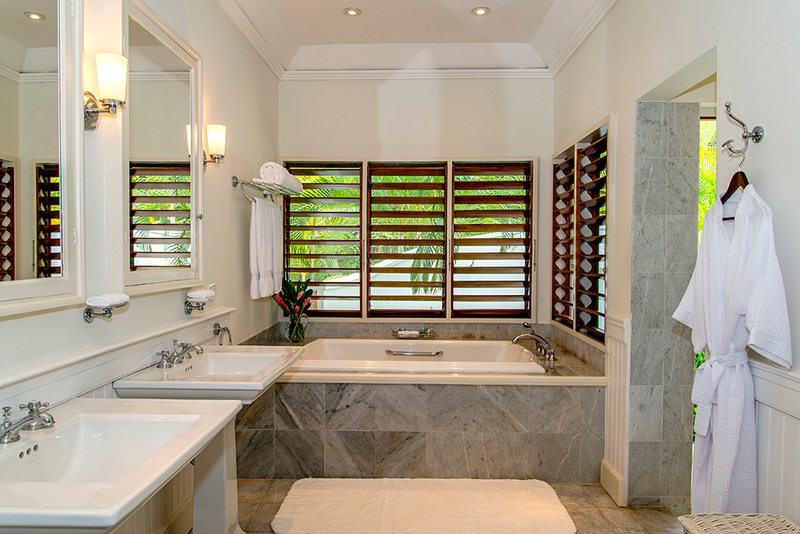 A favorite is the glamorous marble bathrooms featured in each suite with both inside and outside showers for memorable bathing experience under the sun, moon or stars. 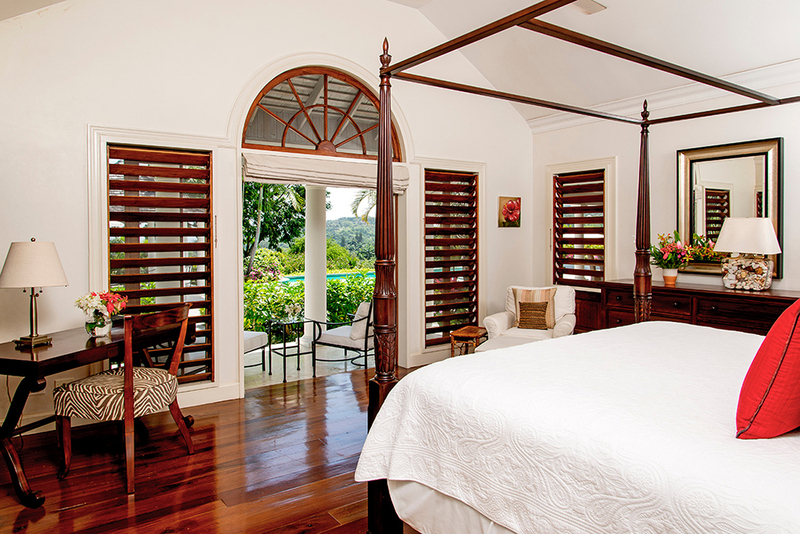 The fifth bedroom (also large) is suitable for children or adults. 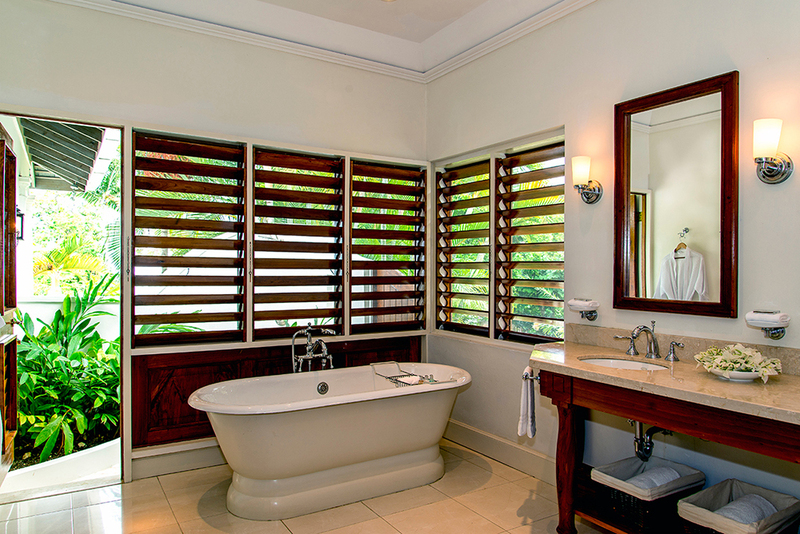 remote control air conditioning; large en-suite bathroom with indoor and outdoor showers. 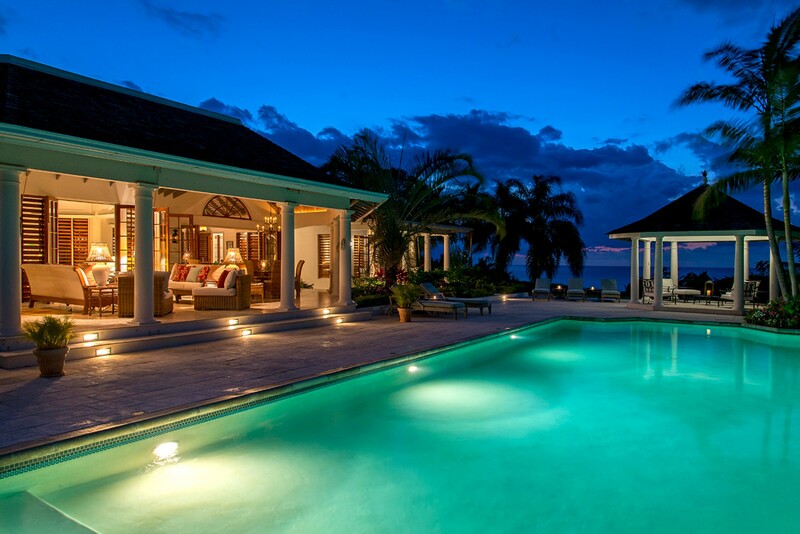 Appropriate for children or adults. 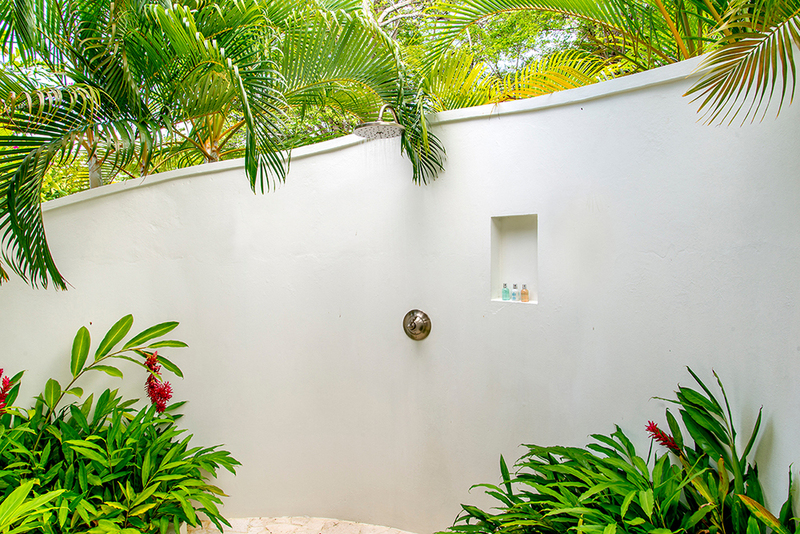 No smoking is permitted in Bougainvillea bedrooms.